Description 4 cell automatic quick charger for 1 to 4 AA or AAA NiMH cells. Input 100-240VAC, 12VDC with 5V 2.1A USB Output for charging phones & tablets. 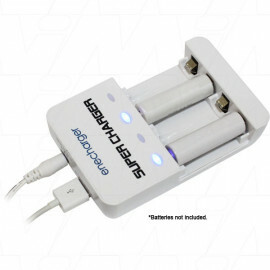 The NC42000USB enecharger is a fully automatic fast charger designed for 1 to 4 Ni-MH AAA & AA cells that also feautures a high power 2.1A 5V USB output to charge phones, tablet & other USB powered digital devices. Recharges 1, 2, 3 or 4 pcs of AA or AAA batteries at a time. Includes external AC switching mode adaptor with worldwide input (100 - 240VAC 50/60Hz) and 12V car lighter adaptor. 4 independent individual cell channels each with an LCD display. Fast charge rates AC or 12VDC input AA 2000mA, AAA 850mA.